It was Aadya’s teacher’s Birthday..sometime in July. 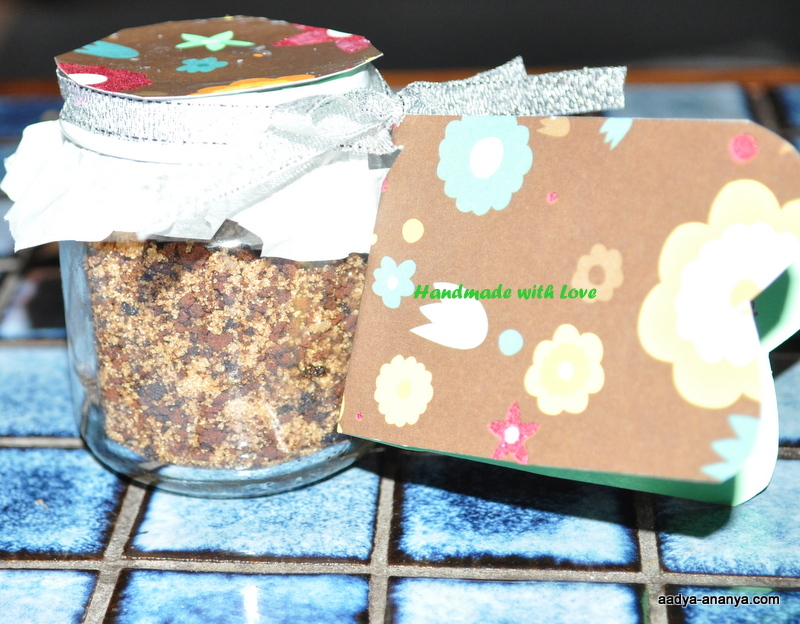 She wanted to bring her a present.It was after 7 pm and we were tired from hosting Ananya’s first birthday party that weekend.I needed something quick,something nice..That’s when I thought of the coffee-brown sugar scrub,that a friend had shared with me. Aadya felt so ‘rensponsible’ mixing up the ingredients. (Responsible) is her new favorite word! Now to package it nicely. I used an empty Baby food jar-decoupaged the lid with some brown scrap booking paper,cut out a gift tag from the same sheet of paper.Filled the scrub in the jar and finished off with some silver ribbon..
Ta da.. beautiful gift ready in a jiffy.. 100 % handmade Love!